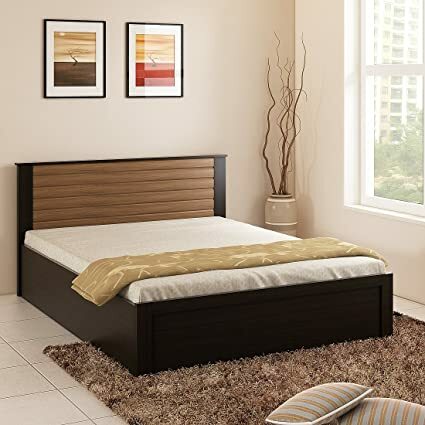 The price for Spacewood Engineered Wood King Bed With Storage ( Finish Color - Natural Teak ) is valid across Bangalore, Hyderabad, Chennai, Mumbai, Delhi, Pune and Kolkata. The Spacewood Engineered Wood King Bed With Storage ( Finish Color - Natural Teak ) is available at best price of INR 15999 on Flipkart. Care Instructions Do not move or push without dismantling. Do not use acid to clean. Do not abuse closing by legs. Use dry cloth to wipe furniture. Do not lift the furniture by holding top. Do not put water on it. Do not expose to sun. Warranty Service Type Will provide the replacement of Damaged parts. The bed height is too low from the ground. And pls know what is particle board.. nut bolts are fancy only.. and the order is non replacement type..